I LOVED this week’s inspiration challenge by Madelynn. I mean who wouldn’t love this room! I WANT that chandelier! I took inspiration from the colours of course, but also the framed aprons on the wall. Be sure to enlarge the photo if you can’t see them clearly. The apron ‘strings’ actually tie around the back of the card. Cute touch huh? The pocket sits away from the apron too. I adhered the bottom in a slightly smaller diameter circle than I cut the pocket with. This means that the sides will angle in slightly especially when you push them that way. Leaves room for a 3-D object in the pocket. I haven’t found anything to use so I hope to find a doll rolling pin perhaps to stick in there. I might even glue one end of a note to it and wrap the rest around the pin tying it with ribbon. The recipient would unroll the paper to read the message.I traced around an oval Nestie for both the ‘armhole’ and the bottom of the pocket and hand cut them. This month we have an AWESOME new SPONSOR, The Greeting Farm (TGF)! They provided me with a great image for use this week. But this is the funny part! It is an image of a teen/tween aged boy! Umm, how do I do pink and brown with a boy… So I hope you will come back next week to see ‘Jake’!! You have to play along with the inspiration challenge this week though because if you do, you can win a great prize from TGF! 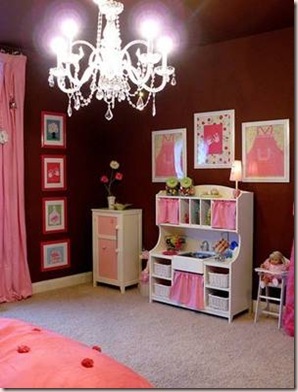 So channel your inner girlie girl and find inspiration in this room! I think we are all playing this week so be sure to check out all of the DareDevils blogs, links on my sidebar or find a full list at Whimsical Wednesdays. Don’t forget after creating a fabulous project using the inspiration photo, to link up on the WW site with a DIRECT LINK using Mr Linky! If you don’t, you won’t be entered to win! To upload to a gallery, use DDSC30. Paper: Bittersweet-Basic Grey, chocolate CS-SU! 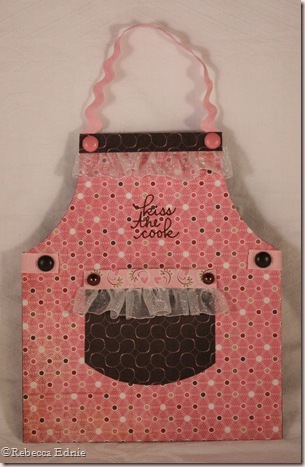 That apron card would be so cute for a cupcake decorating birthday party! 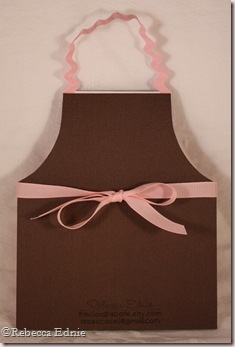 such an adorable apron card! love the cute details on it that gives it so much character! Rebecca, that is the cutest apron ever. Love the colors. Oh how cute. This is wonderful, Rebecca! I can totally see the shape of the chandalier transpired down to the apron card-it's really cool! Wow, how stinkin' creative is that???? I love your take on the challenge, that apron is too adorable!